Maltodextrin, Glycine, Natural And Artificial Flavor, Citric Acid, Silicon Dioxide, Sucralose, FD&C Blue #1. Not intended for children or pregnant/breastfeeding women. Do not exceed recommended dose. People with any health conditions should consult a health care practitioner before consuming this product. Consult a health care practitioner prior to use if you have a liver disorder or develop symptoms of liver trouble. Consult a health care practitioner prior to use if you have an iron deficiency or you are taking lithium. Consult a health care practitioner prior to use if you have high blood pressure, glaucoma, and/or detrusor instability (overactive bladder syndrome). Consumption with natural health products (e.g. bitter orange extract, synephrine, octopamine, ephedra) or other drugs (e.g. ephedrine) which increase blood pressure is not recommended. Consumption with other caffeine-containing products (e.g. medications, coffee, tea, coals, cocoa, guarana, mate) is not recommended. This product is not intended as a substitute for sleep. Do not use if the security seal is broken. Keep in a cool and dry place, away from children. Maltodextrin, Glycine, Natural And Artificial Flavor, Citric Acid, Silicon Dioxide, Sucralose, FD&C Yellow #5, FD&C Red #40. Maltodextrin, Glycine, Artificial Flavor, Citric Acid, Silicon Dioxide, Sucralose, FD&C Yellow #6. Maltodextrin, Glycine, Artificial Flavor, Citric Acid, Silicon Dioxide, Sucralose, FD&C Red #40. 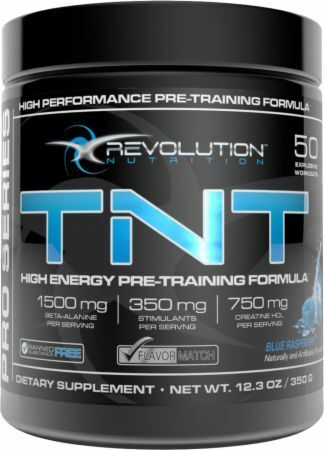 Revolution Nutrition TNT is an extreme high energy pre-training formula specifically designed to energize even the most experienced athlete! TNT is a pre-workout like no other, feel the intensity today! 350 mg of STIMULANTS PER SERVING! Each serving of TNT contains 350 mg of active stimulants (Caffeine, Higenamine and Hordenine) to create the ultimate workout experience! 750 mg of CREATINE HYDROCHLORIDE (HCL) PER SERVING! Creatine Hydrochloride (HCl) is the most recent creatine breakthrough! Creatine HCl is completely soluble in water, it can therefore be absorbed rapidly and does not require a ‘loading phase’. All flavors of TNT have been carefully formulated with ingredients that do not contain gluten. Revolution Nutrition is proud to offer an alternative to people who are sensitive or intolerant to gluten. Flavor Match is a specific flavoring technology developed by Revolution Nutrition so you can easily blend your favorite supplements together in as little as water as possible. Just look for this symbol and match your favorite products and flavors for the perfect supplement solution! All Revolution Nutrition products are manufactured in a state-of-the-art, fully cGMP certified facility. Quality assurance is our top priority and all our products are thoroughly tested and analyzed before leaving our warehouses, this is our commitment to you.